Some on the right view the indictment as a blatant political ploy. "This is pure politics, I tell ya. This is really a joke," Paul told MSNBC's Andrea Mitchell on Monday. The former Texas congressman made sure to mention that he doesn't "generally defend our governor very much," saying Perry's record on civil liberties and foreign policy is "a disaster." But in this case, he added, "the abuse of power comes more from the DA's office than the governor's office." The case centers on Perry's June 2013 veto of the $7.5 million budget for the unit run by Lehmberg after she refused his demand to resign following her drunken driving arrest and conviction. Perry faces accusations of coercion of a public servant and abuse of his official capacity, but he said he has no regrets about his decision and vowed to fight the indictment. Former Florida Gov. Jeb Bush, Louisiana Gov. 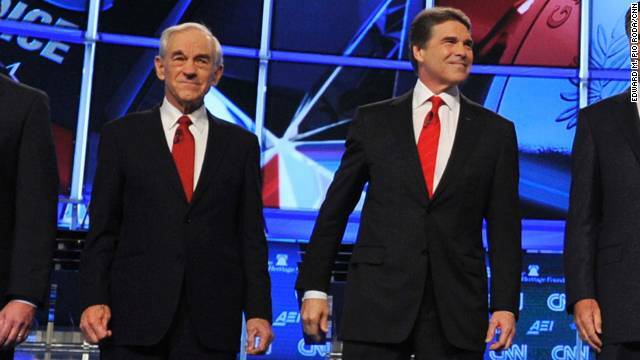 Bobby Jindal, and Texas Sen. Ted Cruz–all potential 2016 presidential rivals for Perry–have also come out in defense of the Texas governor. Paul, who ran against Perry and several others for the 2012 Republican presidential nomination, also addressed the growing national debate over the militarization of police forces, brought to light by the recent events in Ferguson, Missouri. "Police are supposed to be local people, they're supposed to be peace officers," Paul told Mitchell. "They're not supposed to be warriors." Paul did not speak about his son, Kentucky Sen. Rand Paul, who is considering a presidential run in 2016 and who penned an opinion piece last week with similar thoughts about the militarization of police forces. Democrats remind me of the monkeys I used to see at the zoo when I was younger. This was back in the olden days when they were in small, fully enclosed cages because they used to fling their crap at the people. Well, that's what this is. More Democrat monkeys flinging crap. And these are the people you want running the government? Keep your head down America! so lefties, now that you've spent tens of millions of taxpayers dollars in nj on your ridiculous 'investigations', where's the beef?! you still got nothing, nada, zip, zilch! they don't care, it isn't their money. Yeah, none of those "legitimate" investigations is politically motivated at all. THE GOP is a joke. Hmm....so Perry vetoing funds for a whole department because an elected official did not resign when he told her to is ok because that's his authority....but the President using executive actions to delay a tax penalty in Obamacare at the request of the IRS that the IRS already had the authority to do by statute is a huge overreach worthy of being sued. Makes perfect sense. I'd agree with you that on both counts there is no case and each lawsuit should be thrown out. I am pretty sure where we differ is that you think that the Perry suit perfectly legitimate and the Obama one is not. Ahhhh, if only your party was what you thought it was rather than what it really is (and I will say the same about repubs). If Ron Paul speaks for the majority why didn't he ever come close to being elected President. Uh, er, actually we have an indictment! Let me tell ya, perry Paul and his DUMB son BLAND are a national joke along with the rest of the GOP CLOWN BUS!!!!!! Republicans will have to discredit their own investigations...looks like. where did it say he was speaking for the majority? it didn't. he was expressing his opinion. what does that have to do with his running for president? nothing. you must be posting from colorado!